If you are in need of El Cajon bee hive removal services look no further than D-Tek Live Bee Removal. We can handle any size bee removal from small bee swarms to large established honey bee colonies. We specialize in the safe live removal of honey bees. How do we do this? We have a customized live bee removal vacuum that gently removes the honey bees into a holding chamber. We then transfer them into a bee hive box. The final step is dropping the honey bees off to our own San Diego Beekeeping farm. D-Tek Live Bee Removal offers free estimates and inspections. We are also available 24/7 for your El Cajon bee emergency. Our phone number is 760-224-3040. About how long does the average bee hive removal in El Cajon take? Every situation is different. Small bee swarms on trees and bushes can be very quick. An hour or less. The larger established bee hives can take all day to complete. The average bee removal takes somewhere between 2 – 5 hours. This time frame is including any repair work that may be needed to the structure. Why is it so important to fully remove all of the honey comb and beehive from the structure? There are a few reasons why this is so important. Honey bees have an excellent sense of smell. If any beehive is left behind in a structure other bee swarms in the area will smell this. Think of it like having a giant flower inside of your home or business. When hive is left in a structure honey bees will be attracted to this same area for years to come. Another reason it is important to fully remove all honey comb is that once the honey bees are no longer around to tend the hive the honey will often times melt out. This can cause permanent stains/damage to drywall, stucco, siding, wood framing, molding and millwork. It can also damage electrical wiring. With all that honey comb in the structure it is an irresistible treat for many common household pests. These include but are not limited ants, mice, rats, etc. There are some cases where it is not practical to remove the honey comb. These instances are rare but do happen from time to time. We deal with this on a case by case basis. This largely depends on where your El Cajon beehive is located. The most common areas that we see honey bees build a hive is in attics, walls, and floors. More often than not to fully remove the honey comb we will have to cut into either the roof, stucco, siding, or drywall. We understand no one wants to have a roof opened up or stucco/siding cut into. We are not only professional bee hive removers but also experts at construction repair. All roof, stucco, and siding repairs are guaranteed to not leak and to be defect free. If we have to cut into drywall to fully remove a bee hive we guarantee the drywall repair to blend seamlessly with the surrounding area. We perform over a thousand roof, stucco, and siding repairs every year in San Diego County without any leaks or problems whatsoever. What exactly does your El Cajon bee proofing and bee control service include? After the live bee removal and all associated repair work has been completed this is the final step in the whole process. We include with each bee removal service our bee control service for a 10 foot radius around the original bee hive entry and exit point. When we perform the bee control service we have to think like a honey bee. We have to find every crack, crevice, vent, etc that a honey bee could possibly fit through. 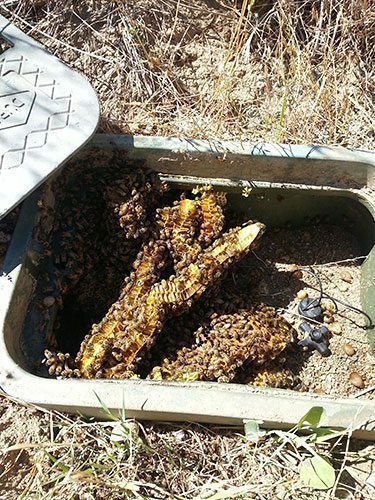 D-Tek Live Bee Removal also offers whole home and business bee control services in El Cajon. It is better to be proactive than reactive. Get your El Cajon home or business bee proofed before honey bee swarming season begins in March of each year. For the cost of removing a small bee hive you can get your entire home or business bee proofed by the hive removal experts at D-Tek Live Bee Removal. With every bee control service we include a guarantee in writing that the honey bees will not make your home their home. Where do you drop the honey bees off after the bee hive removal is completed? We have our own bee farm that we drop the honey bees off to. We are professional beekeepers who have a great relationship with bees. Our apiary has 45 plus hives that are used to pollinate nearby orchards and fields. We then harvest raw honey, pollen and beeswax from our hives that we sell to the public. Are you a farmer looking to purchase or rent a bee hive? We have beehives for sale or rent for pollination services. What are the most common areas that you remove bee hives from? Is there a way you can accurately judge how large of a bee hive is in the structure of our home or business? Yes there is! We use advanced thermal imaging cameras. These essentially allow us to see into a wall, attic, under carpet, hardwood flooring, etc. The area that the honey bees have built a hive in will have a heat signature that is much higher than the surrounding area. This will give us almost exact idea of how large the bee hive is that we are dealing with. This also helps us eliminate any guess work thus giving you the customer a fair price each and every time. If you want your bee hive removal in El Cajon taken care of quickly and professionally give D-Tek Live Bee Removal a call today! Our number is 760-224-3040. If we do not answer please leave a message and we will call you back. We can usually get back to you within 30 minutes. If you prefer, you can email our bee control expert and we will either email you back or call you back ASAP.